In 2015–16, stone fruit production (fresh apricots, nectarines, peaches and plums) was valued at $176 million (LVP). 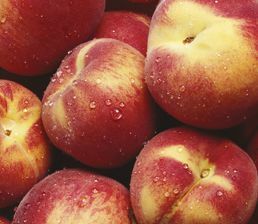 Nectarines and peaches comprised two thirds of national stone fruit production, followed by plums and apricots. Production is mainly located in subtropical and temperate Australia where the industry is a major rural and regional employer. Victoria produces around 50 per cent of Australia’s stone fruit (in the order of 120,000 tonnes nationally) with the remaining production spread between NSW, Queensland, SA, WA and Tasmania. Market access to mainland China for nectarines (in May 2016) and apricots, peaches and plums (in November 2017) has allowed an expansion of exports. During the 2016–17 export season 13,964 tonnes were exported, with 5,886 tonnes going to China and Hong Kong. Other major markets were United Arab Emirates, Saudi Arabia, Singapore and Malaysia. 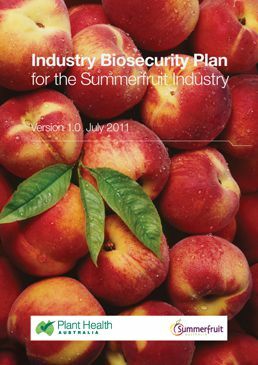 The stone fruit industry is covered by version 1.0 of the biosecurity plan for the summerfruit industry and the Orchard Biosecurity Manual for the Summerfruit Industry Version 1.0. Biosecurity planning provides a mechanism for the summerfruit industry, government and other relevant stakeholders to assess current biosecurity practices and future biosecurity needs. Planning identifies procedures that can be put in place to reduce the chance of pests reaching our borders or minimise the impact if a pest incursion occurs. 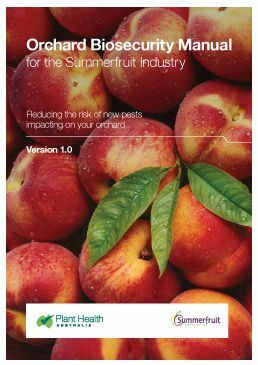 The Industry Biosecurity Plan for the Summerfruit Industry outlines key threats to the industry, risk mitigation plans, identification and categorisation of exotic pests and contingency plans. For a copy, please contact PHA on 02 6215 7700 or email admin@phau.com.au. The Orchard Biosecurity Manual for the Summerfruit Industry contains information to help producers to implement biosecurity on-farm. Manuals usually contain an overview of biosecurity, fact sheets to identify the high priority pests of a crop, tips on crop management, and how to manage people, vehicles and equipment to minimise biosecurity risks. Manuals also contain a biosecurity self-assessment list, and templates to record pest surveillance records and visitors. The following is a list of high priority exotic pests of summerfruit. These pests were identified during the development of the Industry Biosecurity Plan for the Summerfruit Industry in consultation with industry, government and scientists. They have been assessed as high priority pests based on their potential to enter, establish, and spread in Australia (eg environmental factors, host range, vectors) and the cost to industry of control measures. The following is a list of documents for other exotic and endemic pests of the summerfruit industry. Please note that this is not a complete list of pests: rather it includes pests for which documents exist in the Pest Information Document Database. Some of the documents presented here are not tailored to the summerfruit industry and are included for information only.